I write fanfiction, and I'm writing a couple of my own books. 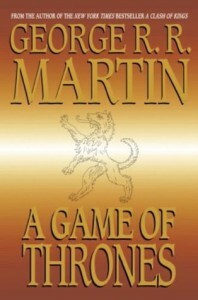 A while ago I read and finished the novel A Game of Thrones. Today I'm finally going to review it. Normally when I review a book I give a brief summary of the book, but we all know what happens so I'm not going to. My favorite part of any book is mostly the characters so that sounds like a good place to start. Eddard Stark is one of the most honorable people in all of Westeros and still one of my favorite characters of the books and show. Ned was just very likable to me. One of the reasons I like him is that he doesn't want power (which is kind of rare in this series), and that he always chooses his children over his honor. It's hard to dislike a character like that. My favorite POV of the book was Arya. She is by far my favorite female character of the series. I really like her rebellious nature. Her chapters were my favorite parts of the book and the show. Arya is just a very relatable character. I wish I could be more like her. Tyrion Lannister ranks high on my list of favorite characters. Some of the best quotes come from Tyrion. He's my favorite Lannister. I really liked him in this book. This may come as a surprise to you (not) but I really love Jon Snow! He is a very interesting character. I loved his relationship with Arya and Sam. Daenerys is a fantastic character (I can't say the same for her brother). Dany is on the best characters of the series in my opinion. I loved her development over the course of the book. I also loved deny and Drogo as couple. I could go on and on about the other characters I love like Bran and Osha, but I haven't even talked about one of the best things in the book: the world. I love the land of Westeros. As you know the world of Game of Thrones is big. It's bigger then any other worlds I've read read about because not only is there Westeros but Essos as well. It makes the the setting feel bigger then it does in some stories. Well, that's all I have to say about the first book in the Song of Ice and Fire. Who is your favorite character? What was your favorite scene that transitioned from the book to the show? I hope you like my review, and I'm sorry if it felt like I was babbling.